Have you noticed more Driving Under the Influence (DUI) checkpoints lately? Have you noticed more and more celebrities getting arrested and convicted of DUI charges lately? One only has to open their local newspaper to see Paris Hilton, Lane Garrison, Nichole Richie, etc. and their problems with DUI’s! Well, there is a reason for all of this. California is “cracking down” on DUI’s and going after DUI offenders with an iron fist! Local law enforcement agencies and probation departments have recently allocated millions of dollars to go after DUI offenders. What this means is more DUI checkpoints, more officers working overtime just to combat DUI’s, more probation officers being hired to deal with DUI offenders if they are convicted, etc. Thus, it is now more vital than ever that Californians be aware of this and have a trusted and experienced drunk driving defense firm that they can immediately turn to, should they be pulled over and cited for a DUI! 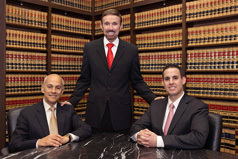 Wallin and Klarich is one of the biggest criminal defense firms in California and has been fighting DUI’s for over 30 years in Southern California. They have the experience and the knowledge to help you face the Courts and the DMV regarding your DUI issues or any other criminal matter that you may have. So, if you should ever find yourself in the unfortunate position of being pulled over on suspicion of DUI and have those glaring red lights reflecting back at you in your rearview mirror, call a California DUI defense attorney at Wallin and Klarich immediately and they will assist you in your time of need!